The Choice Is Clear | CATE MONTANA, M.A. There’s nothing worse than dithering over a decision. Whether it’s which house to buy or what to wear in the morning, which paint color to go with or which lawyer to hire to save your um … bacon, choices can paralyze the best of us. The MIND wants to take over. It prompts us to makes lists with PROS and CONS on each side of the page. But is this really the best way to make an important decision? NO! Studies show that the world’s greatest leaders, entrepreneurs and artists go with their gut. Sure, they take the facts into consideration. They do their due diligence. But then they LISTEN to what their body is telling them. Your body is your greatest ally. It is an energy device—an energy “reader.” It knows what’s what with your subconscious mind, your conscious intention and the information flow of existence all around you. It knows the fastest path to reaching your goals, your hopes and your dreams. Satisfy Your Mind – Do the research necessary, get all the facts, go ahead and weigh your options. If you don’t do this step, your mind will never leave you alone with your decision. Set aside all the facts and ask your body – Take a deep breath. Close your eyes and ASK your body: which path shall I take? 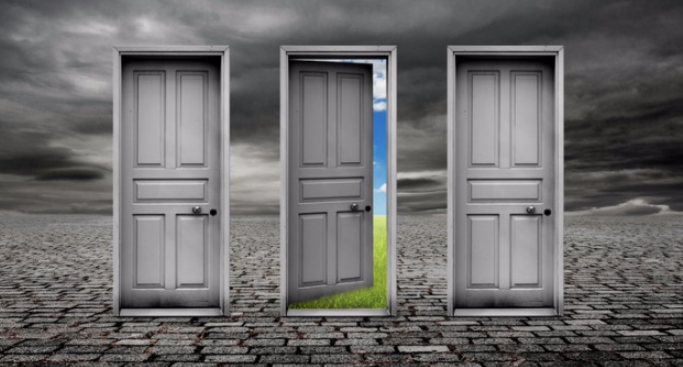 Which door should I open? If it helps, imagine your choices one at a time. As you imagine doing or having one choice, stop and register how you feel. Is your body happy? Does it feel calm? Light? Expansive? If so then you’ve got your answer! The option that makes you feel lightest and most expansive is always the right choice—even if it looks like it’s taking you in exactly the wrong direction. Trust your feeling sense. The body is part of the universal matrix of information. The energy may be pointing you south when you want to go north because if you go (illogically) south, you’re going to meet someone or discover something that will make your trip north SO much easier/better/quicker/happier. Your body is an energy system that reads the energetic messages (information) from the universe. Not your mind. Your mind can later interpret the energies. But it’s the body that is the most trustworthy guide.